I’ve enjoyed these ever since I got my red card. I never really cared for edibles too much until then, it was always some sketchy cookie made by a hippie, a little Tootsie Roll type thing, or some horrible tasting hard candy. They never did anything for me either, probably due to the fact that they always tasted bad. So when I got my card I was determined to find good edibles, and it started with this! 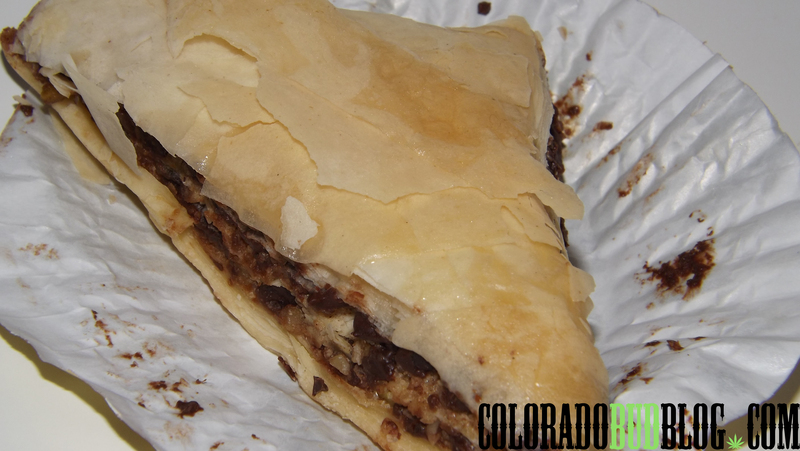 This is a Choclava from The Growing Kitchen. A baklava is a layered pastry, consisting mostly of layers of Pyhllo Dough, and usually chopped nuts, and then drenched in honey or syrup, in this case it was drenched in honey oil. 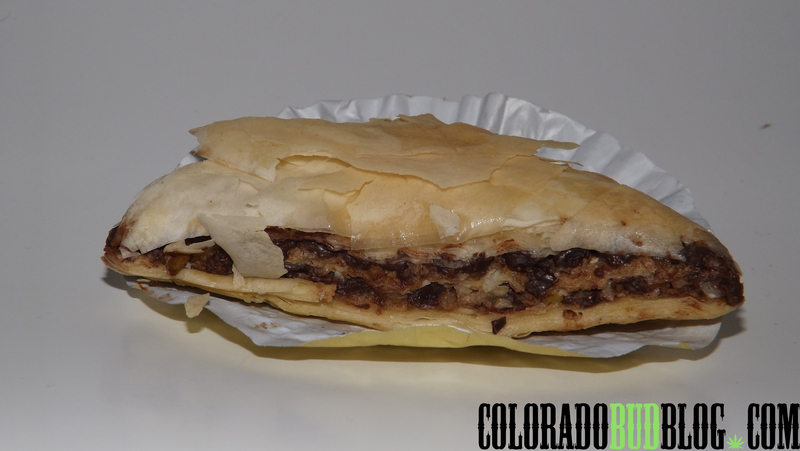 They call this a Choclava due to the dark chocolate chips used in one of the layers. There are also pistachios, almonds, walnuts, and brown sugar. I always eat them in the morning with a hot cup of coffee. 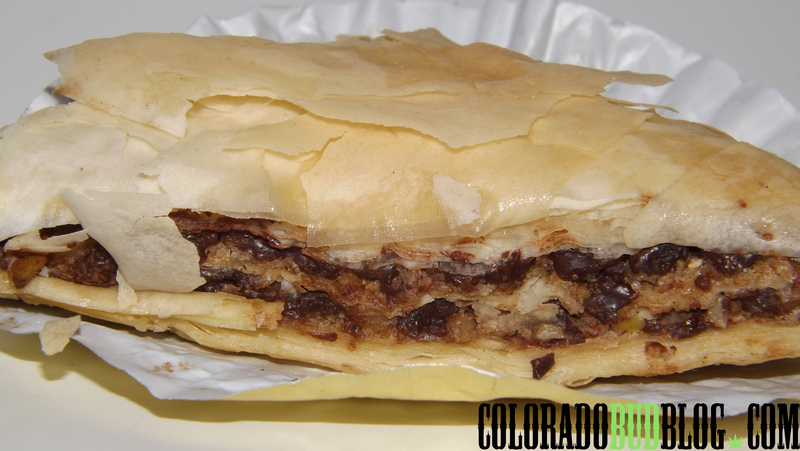 When you bite into it, you instantly can taste the honey oil that is drenched over the layers of phyllo dough. The delicious dark chocolate flavor will immediatly follow. It finished off with the flavor of chopped nuts and brown sugar. 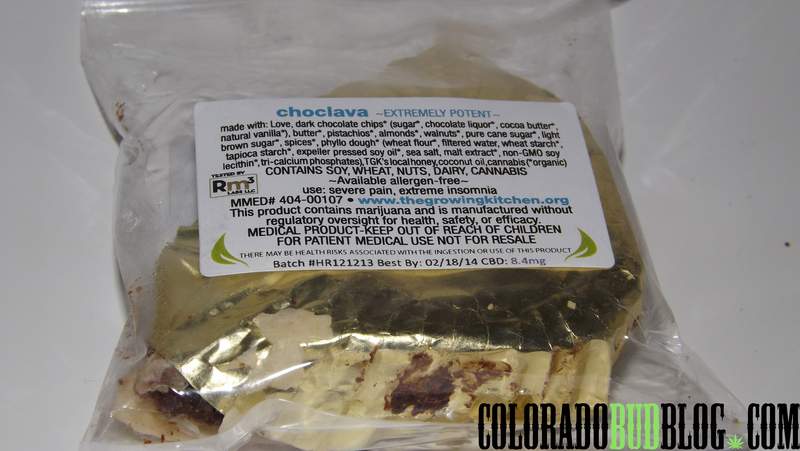 As the packaging warns you, this edible is EXTREMELY POTENT, with 200mg THC and 8.4mg Cannabidol (CBD), so keep that in mind when eating it. I have a high tolerance so I usually eat the whole thing over about 30 – 60 minutes, but I highly recommend you PACE YOURSELF if you are indulging in one of these. These help me a lot with anxiety because they put me in the best mood. It makes me more talkative, I tend to get the giggles, and act a lot goofier than I normally would. They are also totally organic, which is a big thing with The Growing Kitchen. The best part about these is the price: never more than $13.00! Which is a great price for that amount of THC. 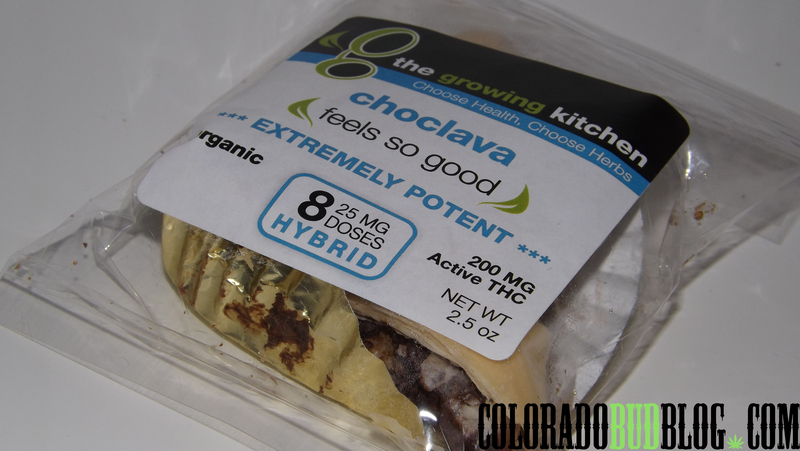 So if you’re looking for a different kind of edible, that is highly effective, organic, and at a great price, I recommend you pick up a Choclava from The Growing Kitchen! Check out more edibles from The Growing Kitchen at http://www.thegrowingkitchen.org!